NI taps are designed to efficiently cut high temperature and nickel based alloys such as Inconel, Waspaloy, Hastelloy, Monel and others. NI taps are made from premium powdered metal HSSE-PM material selected to withstand the rigors of machining these challenging materials. 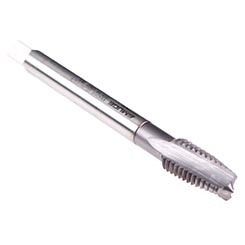 PVD applied TICN multi-layer coating options are available to help improve tool life. Extensive research and testing programs have perfected this unique style of taps for the most challenging of materials. Manufactured with VHC Technology, a specially ground relief geometry in the primary cutting zone, that generates a smaller and tightly rolled chip formation. The resulting benefit is enhanced chip control to prevent the damaging effects of chips jamming in the tap teeth on both forward and reverse. 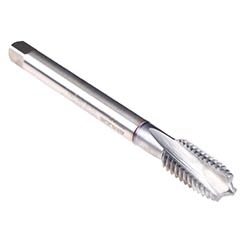 Designed with Advanced Left-Hand Helical Flute Form and chamfer geometry combine to optimize chip evacuation in the forward direction and add strength to the cutting teeth for enhanced tool life and process security.